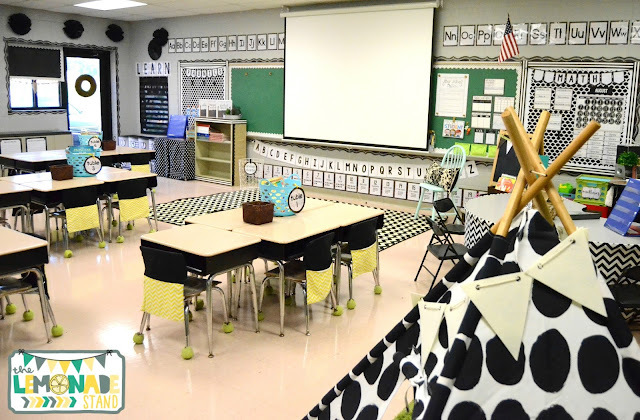 Welcome to my farmhouse inspired classroom! I have been wanting to post a classroom reveal since school started, but things just got crazy. 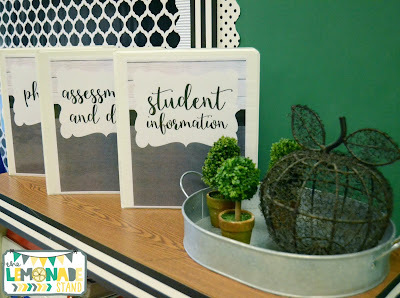 I moved to a new district and new grade level this year, so I felt like I needed to take that time to get readjusted. Sadly, this poor little blog suffered because of it. But I am so excited to be back and share my home away from home. That was the feeling and look I was going for with this classroom. 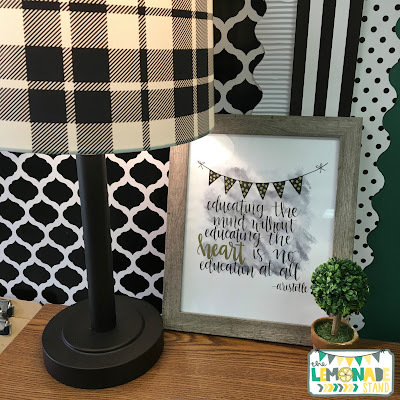 I am a huge fan girl of Fixer Upper, Joanna Gaines and the farmhouse style, so I wanted that to be reflected in my classroom. 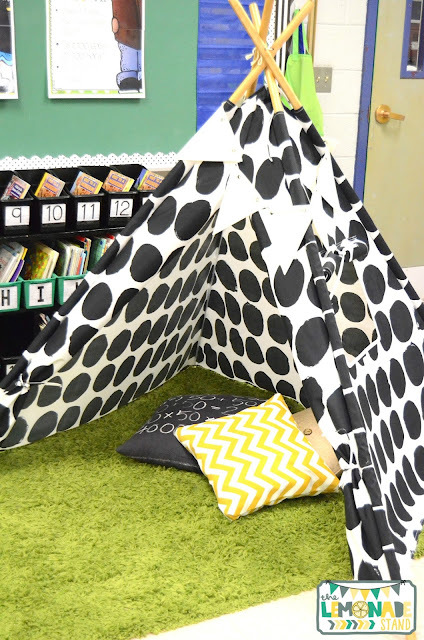 But I also wanted it to be a fun, inviting place for my first graders, so I blended the two. 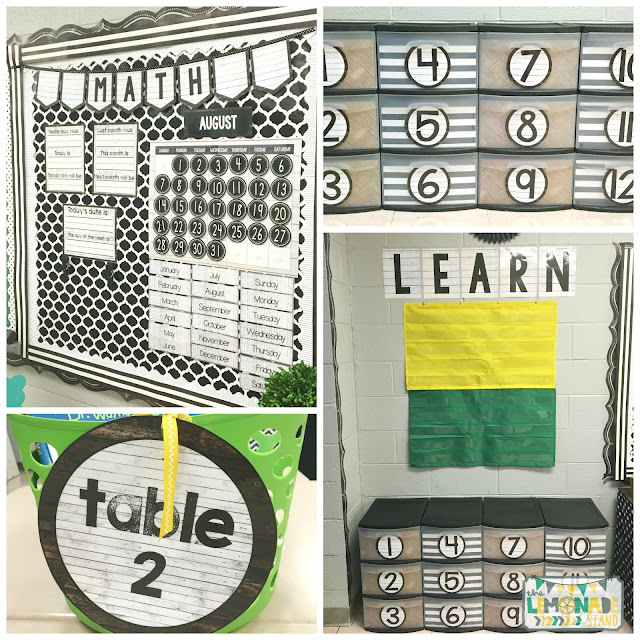 Let's go on a tour around my classroom! This is the view as you walk into the door. I wanted to use a mostly black and white color scheme, but I have lots of yellow, green, and blue supplies and storage pieces so I had to incorporate those colors, as well. 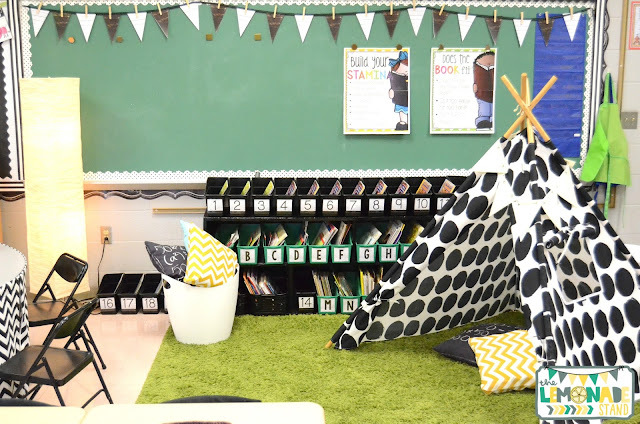 The first thing that catches everyone's eye is the classroom library. It's the most coveted area in the classroom for my students. They are in LOVE with the teepee! And so am I! I picked it up at Target on clearance. I have my books sorted by guided reading levels in this area. There are also some other tubs with themed books. 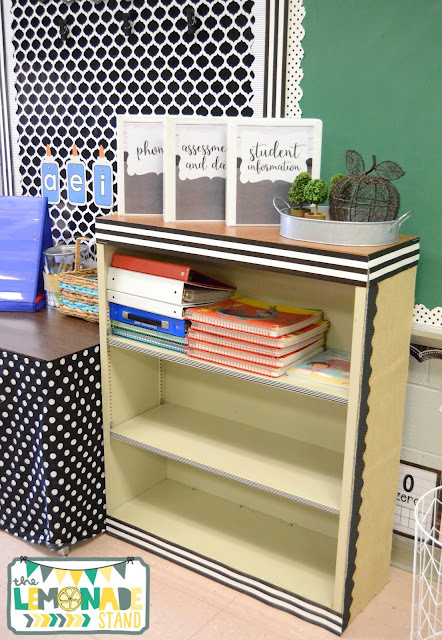 Students keep their own book bins in this area, too. I loved that this classroom still had the original chalkboards. They went perfectly with the theme, so I had to keep them. 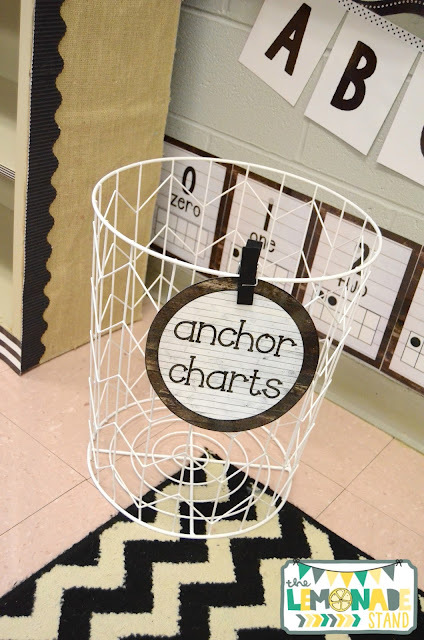 They are magnetic and great for hanging my anchor charts. I picked up these clips from Target and hot glued them to magnets. 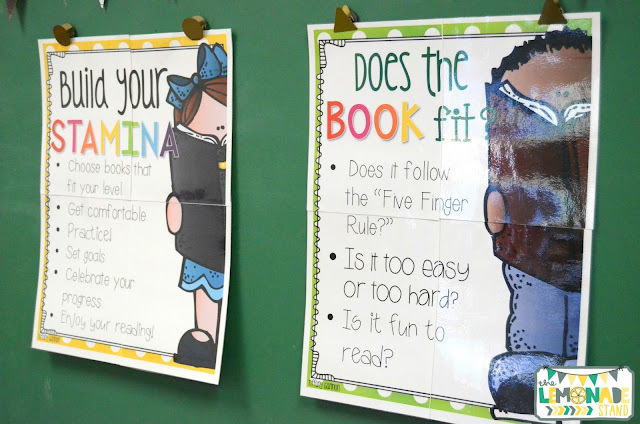 These posters are from my Reading Ready unit. 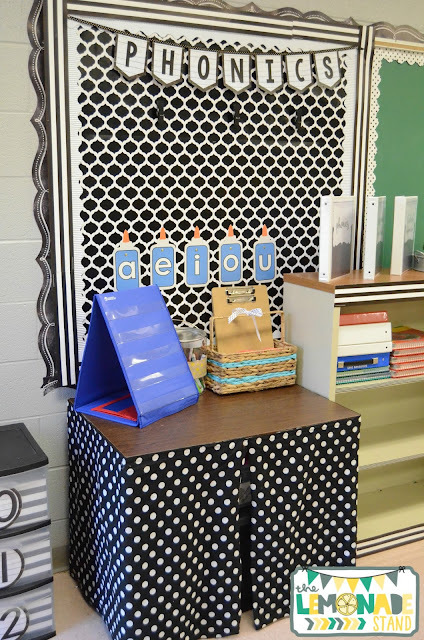 There is no closet in my classroom, so I have fabric around all of the tables to hide stored items. I just hot glued the fabric to the edges of the tables. I also hot glued the hems. Hot glue is my best friend! 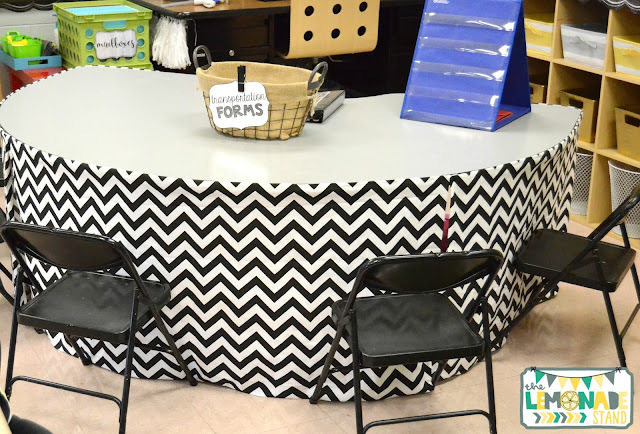 This is my small groups table in the corner with my teacher desk. I store all of my small group materials in the shelf to the right. 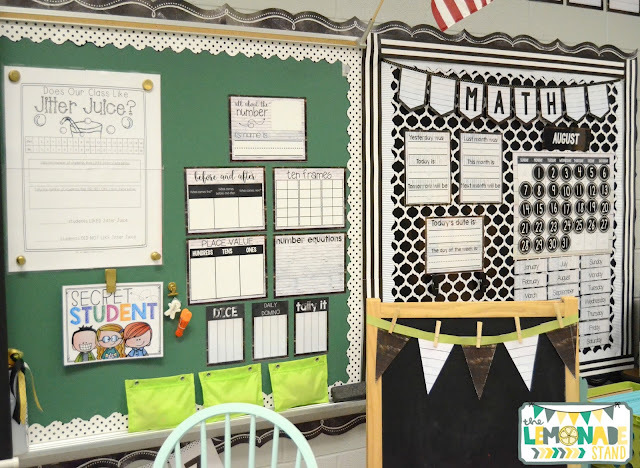 There is a bulletin board directly behind the table, where I hang small anchor charts related to what we are working on at that time. 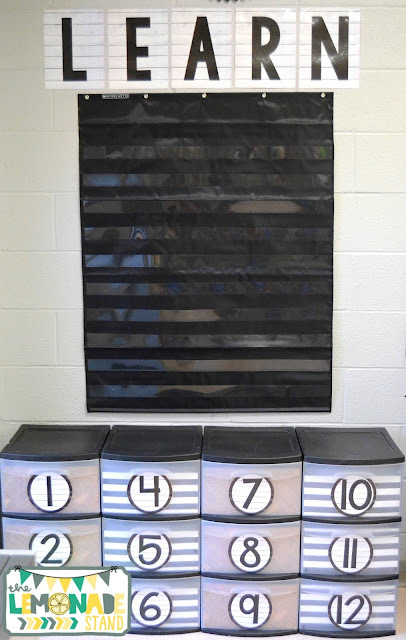 I also hung this reading strategy banner above to refer to during guided reading. This area is my calendar and number of the day board. I also hang the interactive anchor chart for the day here. This is from the first day of school, so it looks a little different. The board on the right is covered with wrapping paper. Here is a little snapshot of our mailboxes. I like filing student work in a crate because it's portable. I picked up the hanging file folders from Amazon. This is one of my favorite areas! 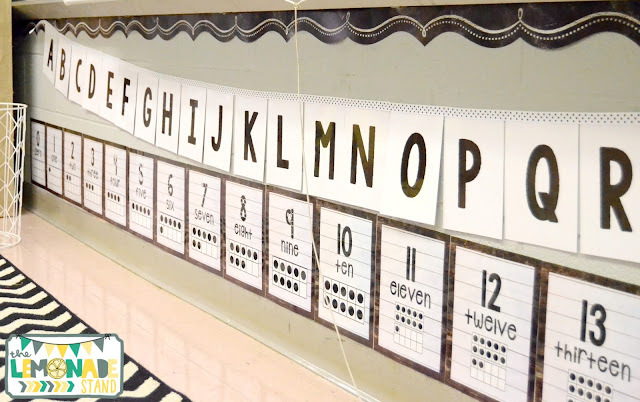 I love the alphabet banner on the polka dot ribbon and that my number line looks framed. 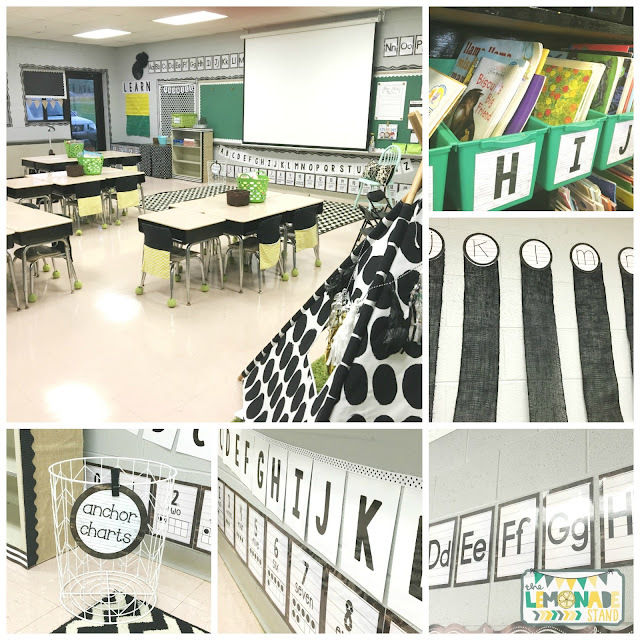 I put my number posters and alphabet on the floor for easy student access. 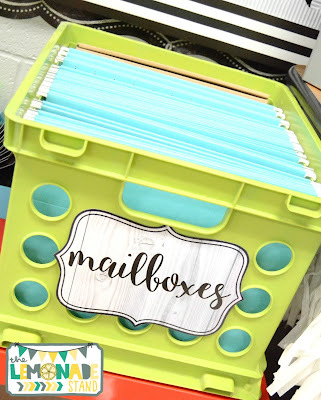 I use this laundry basket from Target for anchor chart storage. This metal shelf was just not cute. I was running out of time and energy to paint it. I ended up just hot gluing burlap to the sides and border around the edges. I also added some washi tape to the shelves. It made all the difference! My new teacher friend made this print for me. It was customized to fit with the farmhouse decor. I am just amazing by her hand lettering talent! And the quote was just perfect! You can check out her Facebook page Paper Dot Ink HERE. 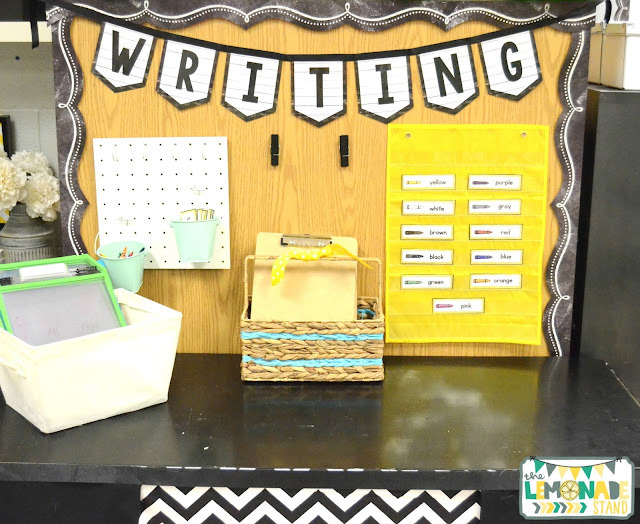 My word work area is up front in this area. I post the words of the week in a pocket chart. They have different options of how to practice those words, play dough, typing, games, magnets, and more. It's a super easy center to manage for me since I just change out the words each week. 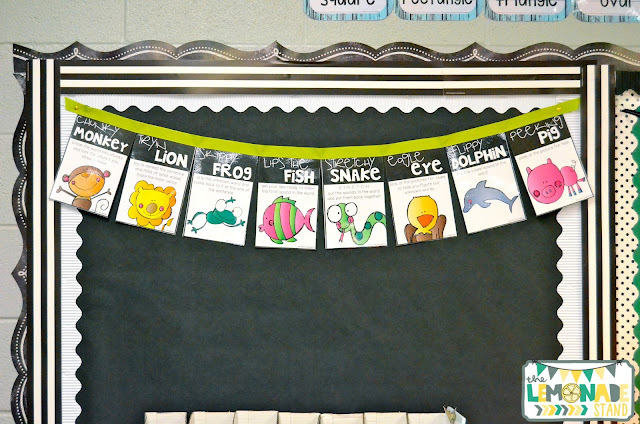 I use the clips to hang the anchor charts we make related to the rule that week. 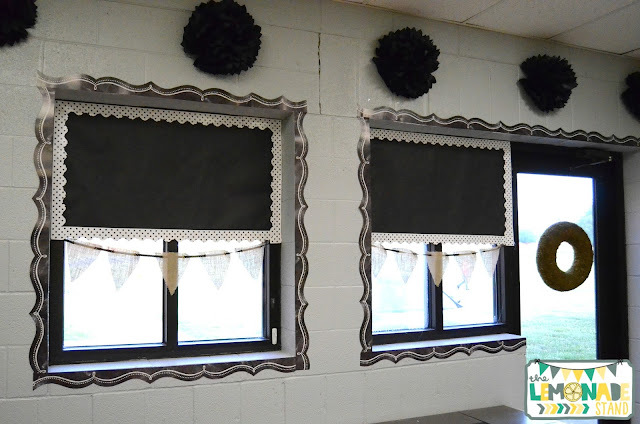 My windows are lined with bulletin board border. It really ties the whole room together! The curtains are actually fadeless paper that I doubled up. I outlined them in border, too. I found the little burlap bunting at Target on clearance. This is my writing center. I love the peg board from Target Dollar Spot! It holds prompt cards (from The First Grade Parade) and crayons in the cute little buckets. I covered this table in fabric, too, for extra storage below. I am hoping to go to Ikea soon to pick up some stools for this table. My word wall and computer center are at the back of the room. The word wall letters are in my Farmhouse Decor Pack and the black burlap ribbon is from Hobby Lobby. 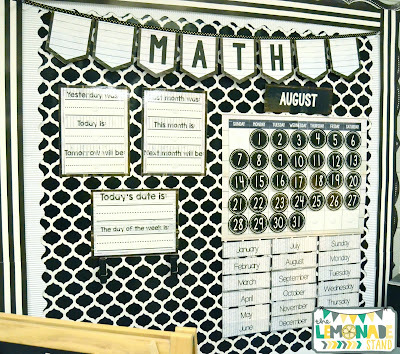 The little Mason Jar numbers below the word wall hold student work. 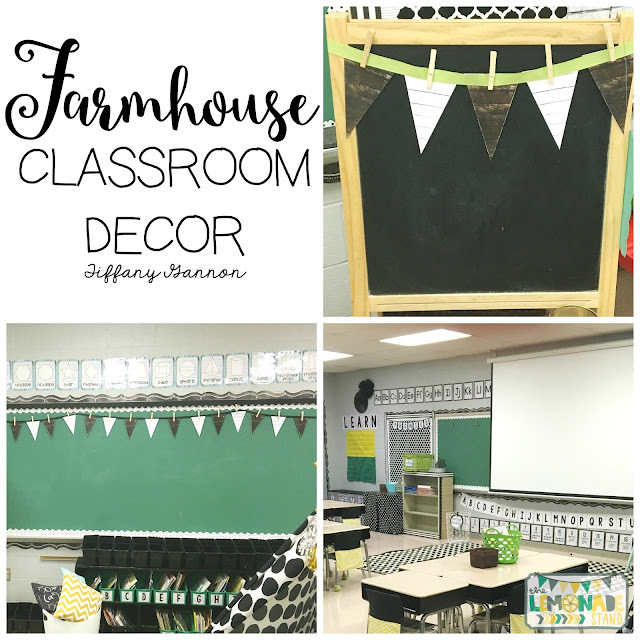 That was a little peek into my farmhouse classroom! Pretty much everything printable you saw was from my Farmhouse Decor Bundle. I am slowly breaking it apart and selling items separately. You can click on any of the pics to take a look at it if you are interested in redecorating your room for that farmhouse, shiplap look. What company sold the hanging file folders on Amazon. I love the color.